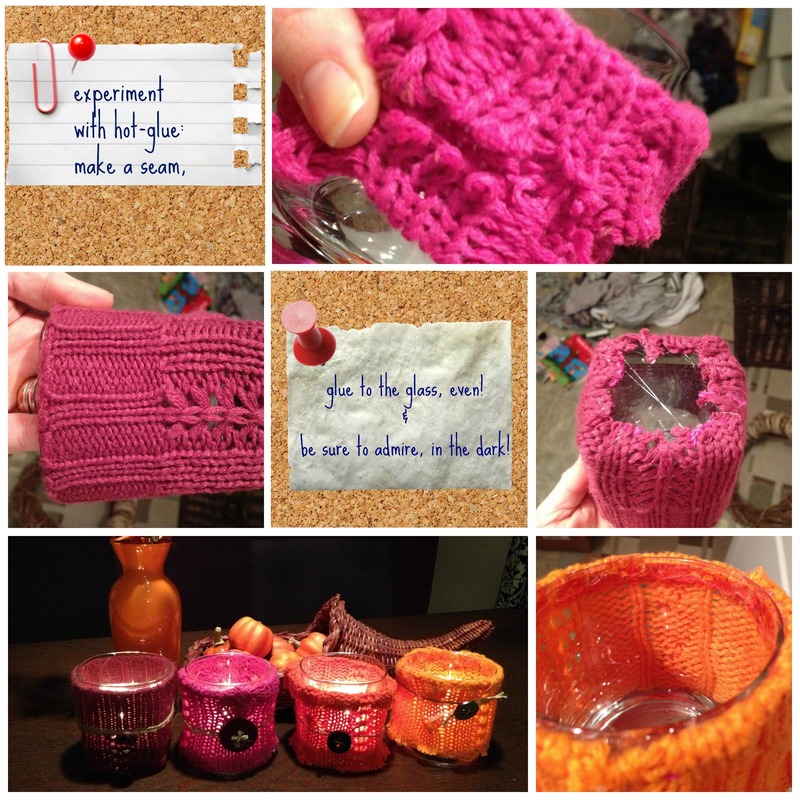 The Craft Fairy | 100% of my crafty friends recommend this site! 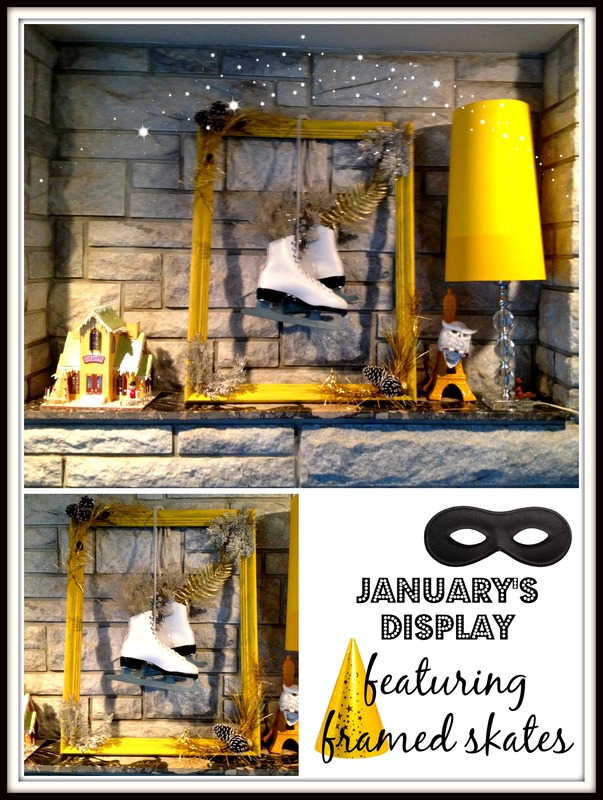 So… I last posted about changing displays, and how I came against a brick wall (literally, brick facade) of the upstairs mantel. 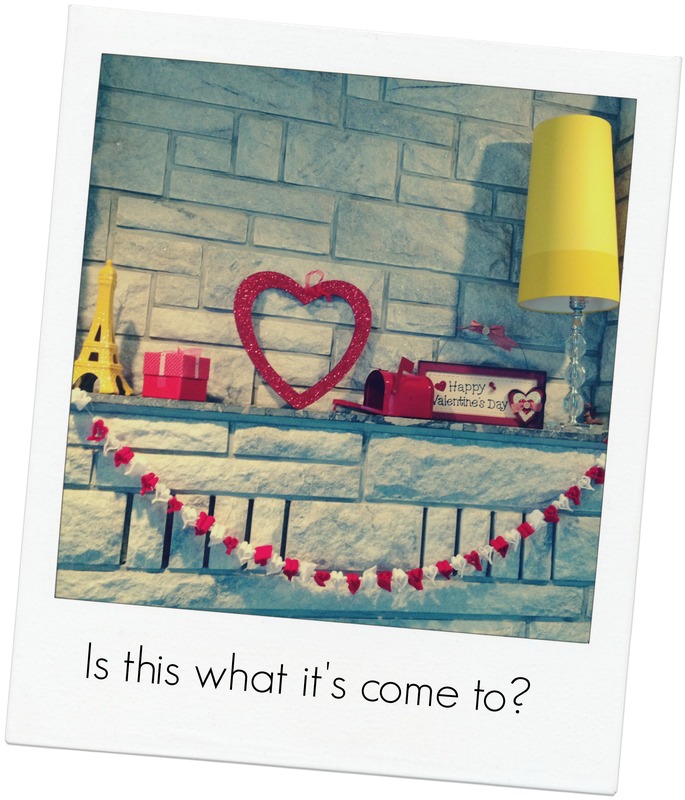 My living room is black-white-grey-yellow… how the heck do I make it all Valentine’s-y in there with THAT combination?! I started to play around on Pinterest, looking for “gold” hearts, and came across this fabulous post by Oleander and Palm. 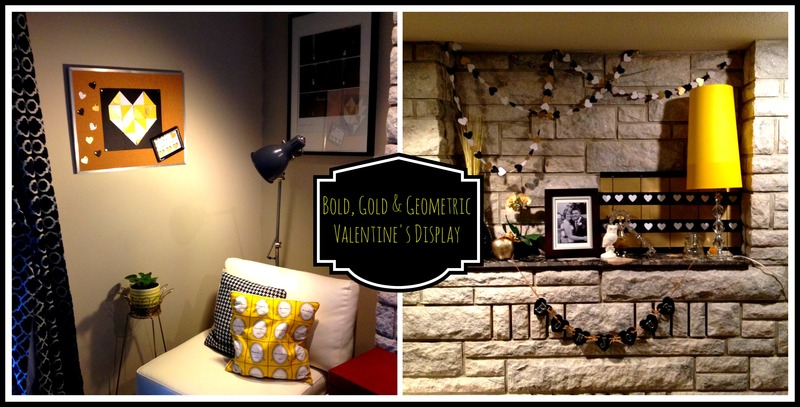 I LOVE the geometric design (so hip right now)… the more I played with the gold idea, the more this mantel came together. I wanted some kind of bigger back-drop-art-thing to help balance out the R – by the big yellow and crystal lamp. While looking through my choices for canvases, or bigger frames, I found this old leather and elastic photo display. Lookie there.. the back is black! I knew I had some old pieces of gold card-stock, and so I just started playing with the placement of gold stripes with white hearts. *Romantic side-bar, this gold card-stock was first used 10.5 years ago when I was making my wedding invitations. I cannot believe I’ve held onto it this long.. and moved it this many times. But it does make for a sentimental addition to this display!! 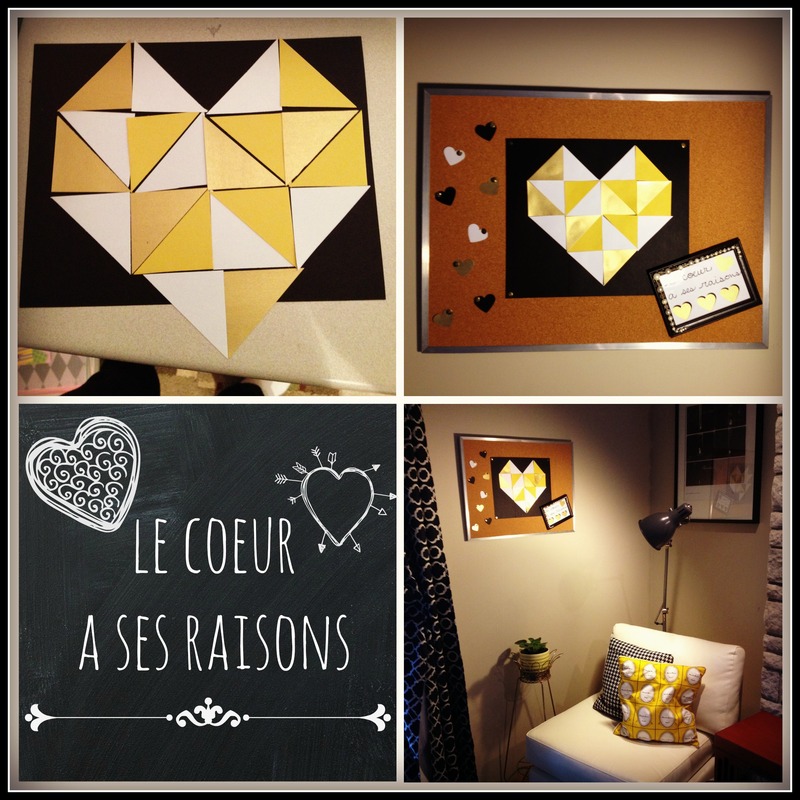 After I made this piece, I decided to go for the fabulous O&P geometric heart. I took down the old Sherlock Holmes cork board, and started to rework it with the tri-coloured triangles. I added some free-floating hearts down one side, and then a framed quotation on the other. I LOVE IT! 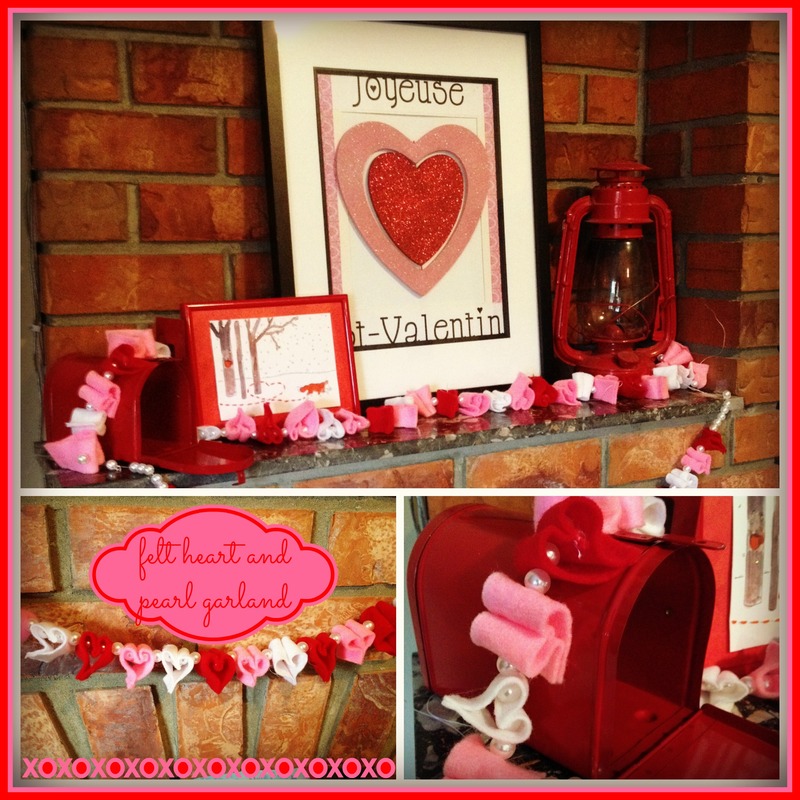 I’m going to use this pattern at school with the kids to decorate their V-Day mailboxes. 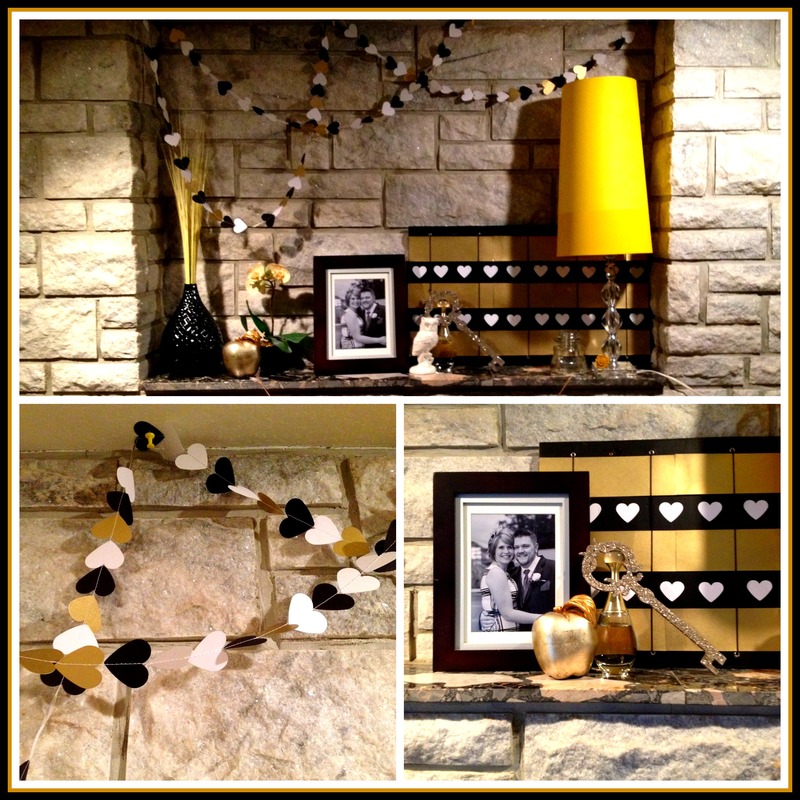 When I started playing with the mantel, I decided that I wanted some height – and what better way than a sweet paper heart garland that I sewed up tonight. This was good practice for a chandelier that I’m hoping to make for an upcoming party. 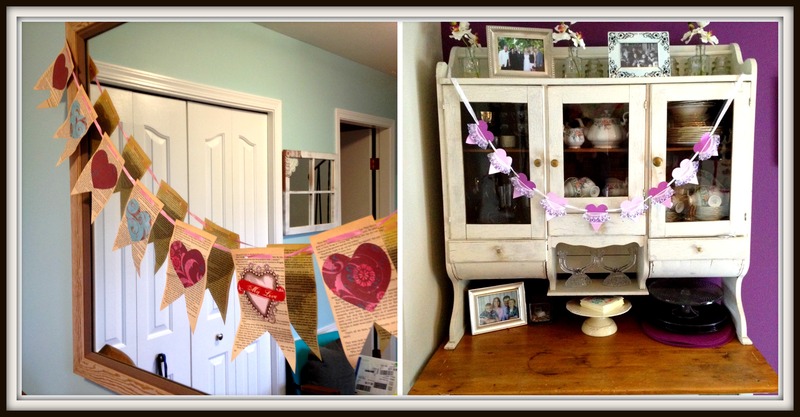 I went around my house and found random things that were gold, glittery or otherwise matched the colour scheme! I love the little vignette with a photo of me and my man, my bottle of “J’adore by Dior”, an old glittered up key and an apple… which later got replaced by an owl. I’m so happy with the final transformation in the living room. Hope you’re having a heart-tastic day too! 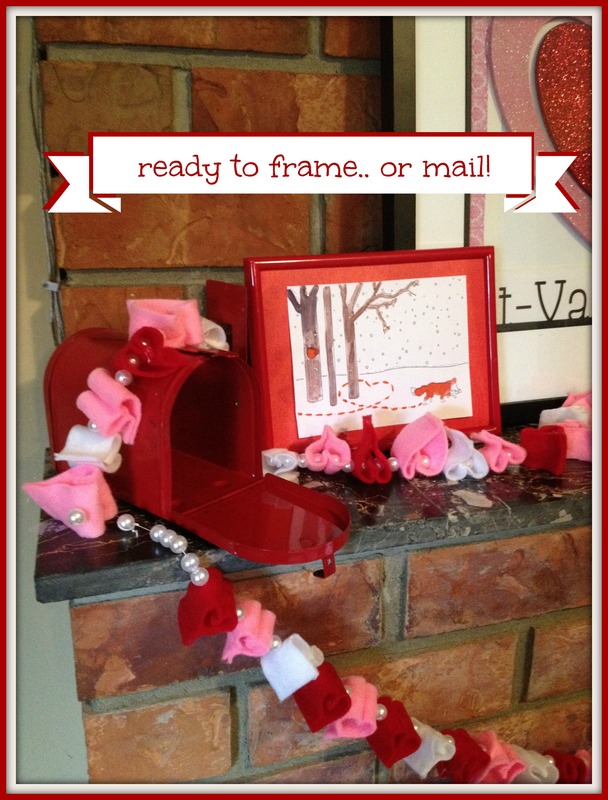 As the weather starts to warm, and we near the end of the month, it’s time for me to say goodbye to the white Winter-themed displays around my house, and hello to the fabulous reds and pinks of Valentine’s day! This year, I might even keep them up through March, as I LOVE V-Day (as previously mentioned) and I’m not really feeling the Irish Green this year. 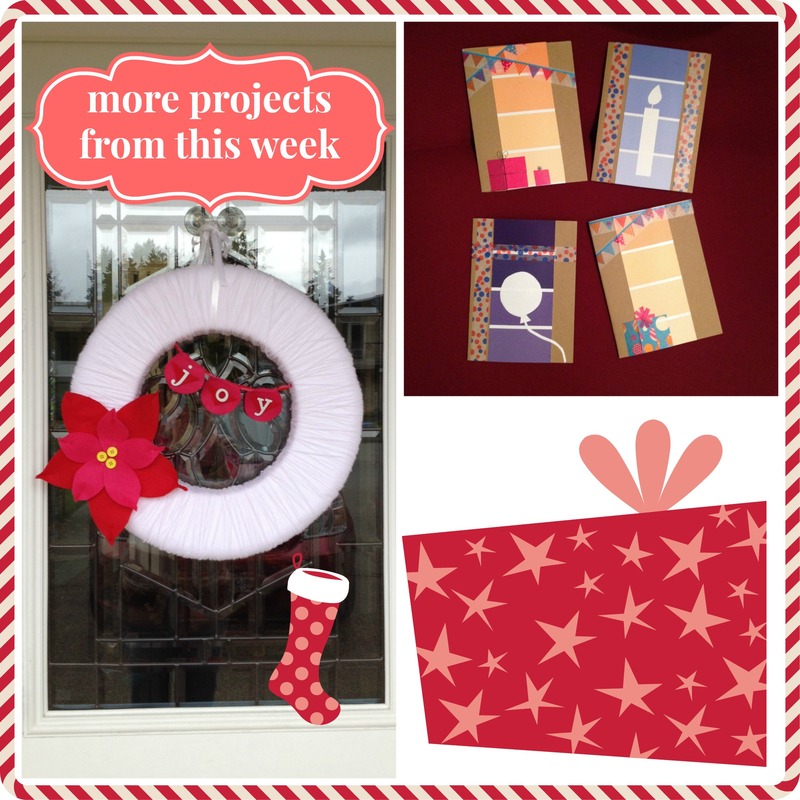 I’m happy to show off some of the crafty things I did last year, before the birth of The Craft Fairy, and also a project I did WAY back in December but never blogged about. Here we go on our tour! I made this framed skate-art last year and I absolutely adore it. I think the whole thing cost me $3 ($2.50 for the skates). I got the foliage from a free bin at the church bazaar, and the frame I painted up a cheery yellow to go with my living room accents. 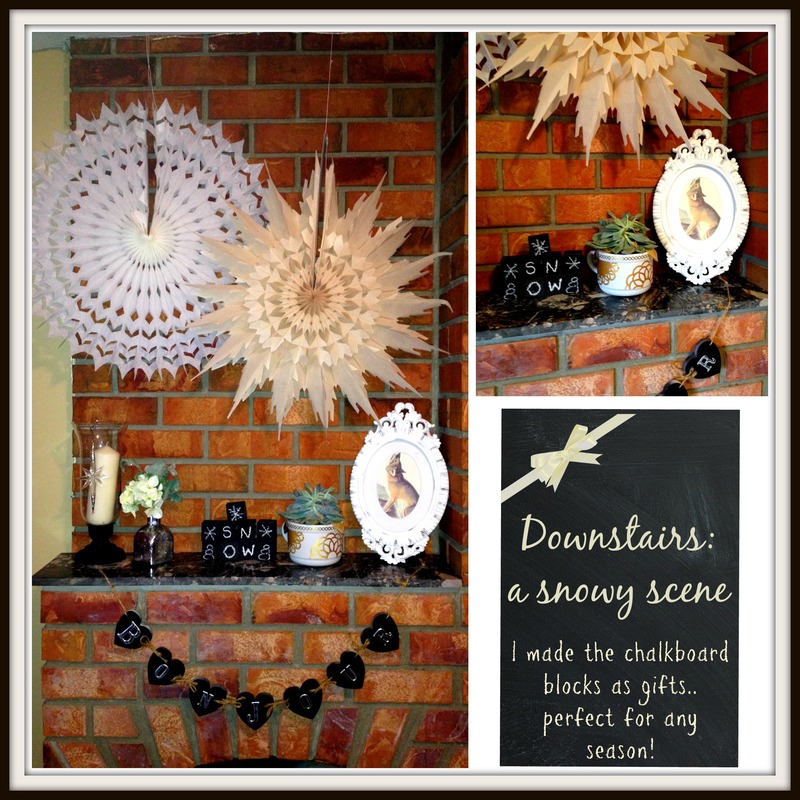 Downstairs was a little more subdued, with these fabulous vintage honeycomb snowflakes, a decoupaged gold succulent from Krista and a beautifully framed zoological fox print from Brittney. The “snow” blocks I made as little gifts for my crafty lady friends. I used leftover blocks from my baby block project and painted them with a mixture of black craft paint, plaster of paris and a little water to get the right consistency. You can chalk them up for any event or season, classic black – perfect for any colour scheme too! I was super happy with this adorable wreath that took my all of 1 minute to make. I found Mr and Mrs Fox ornaments on clearance at Target when I was travelling in California, along with the sparkly grape-vine wreath. 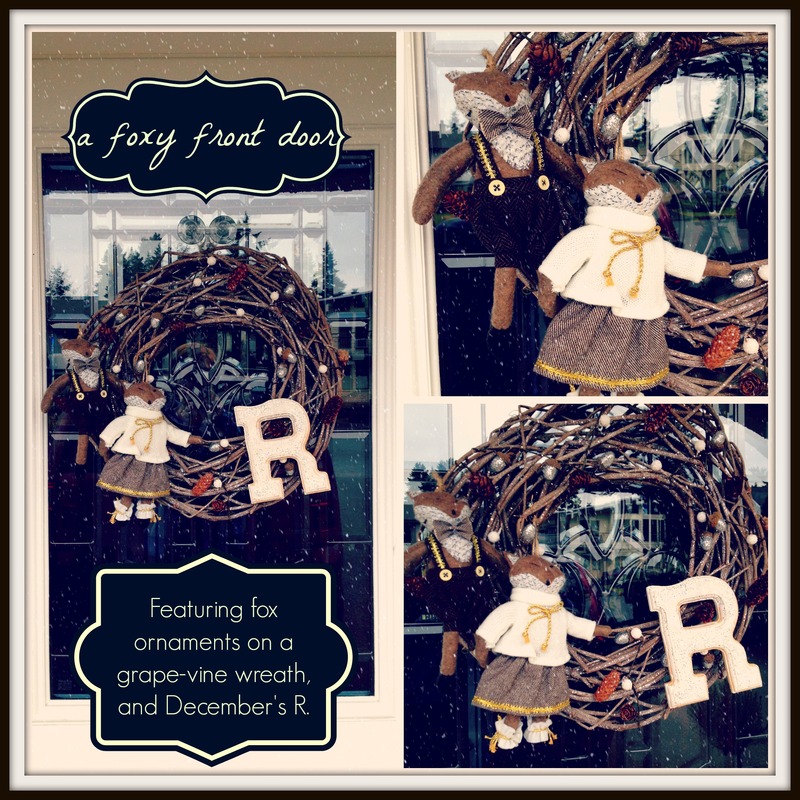 I merely attached the little figures and moved the R from my December frame and basket wreath. They were warm ambassadors for my front door. 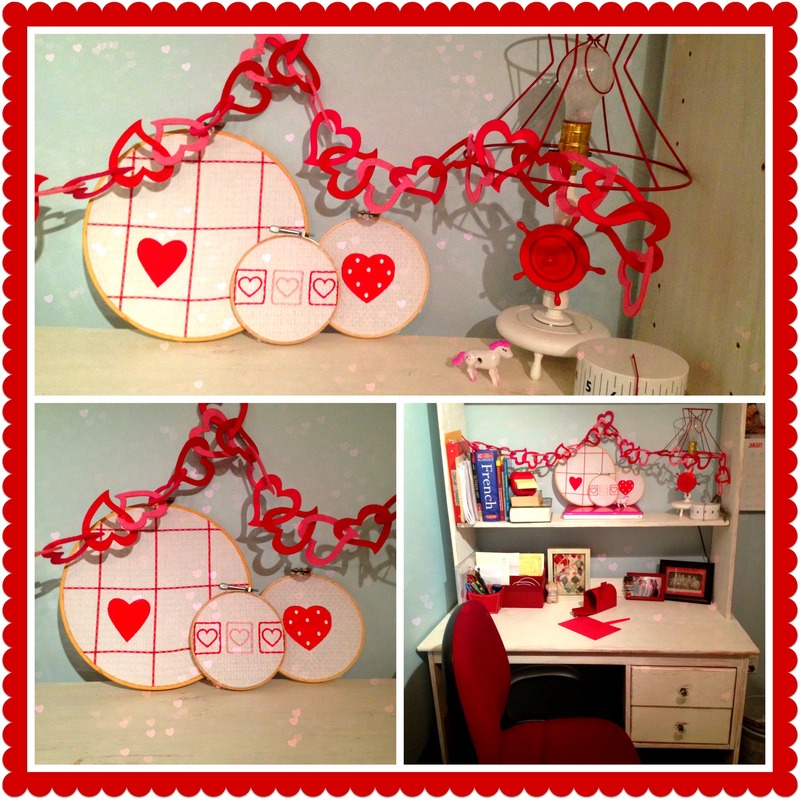 I made this adorable pink, white and red felt heart & pearl garland last year. I took a long rectangle of felt, folded it, and sewed a seam parallel to the fold. I then sewed up a long tube of felt at one end, then, opened the seam, and placed the ends together, sewing another seam along the bottom. 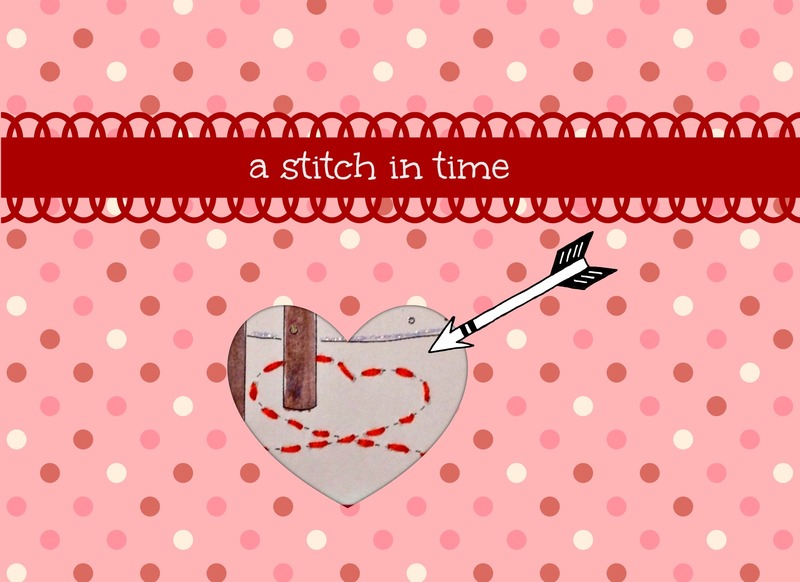 Then I cut at 2″ intervals, cutting many hearts out. I needed to string pearls between the top “lumps” of each heart, to keep them open so they would be heart shaped, rather than squishy felt shaped. 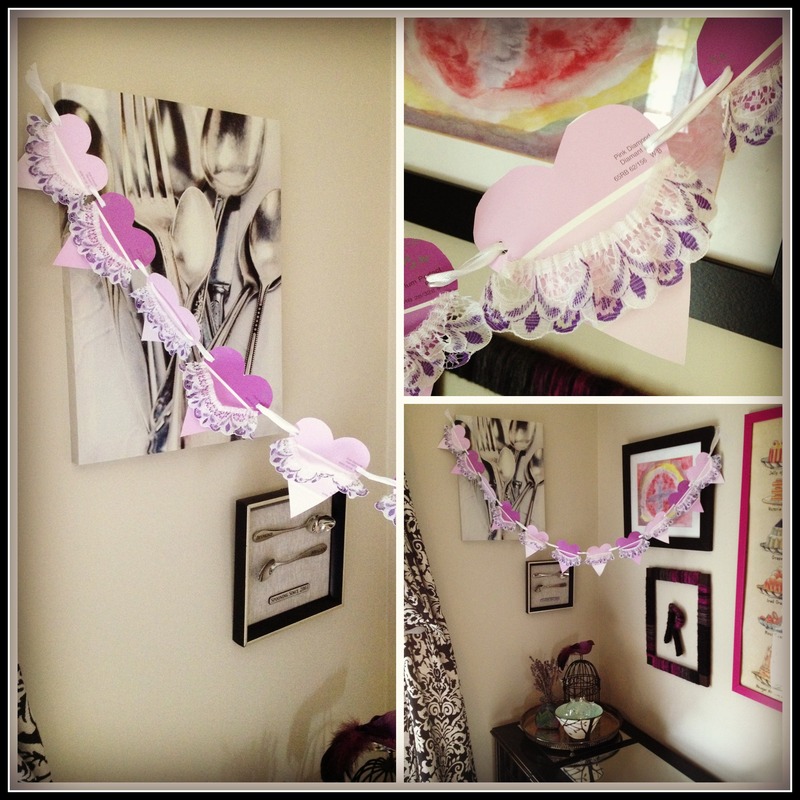 This was a super easy project and I made a ton of garlands very quickly. 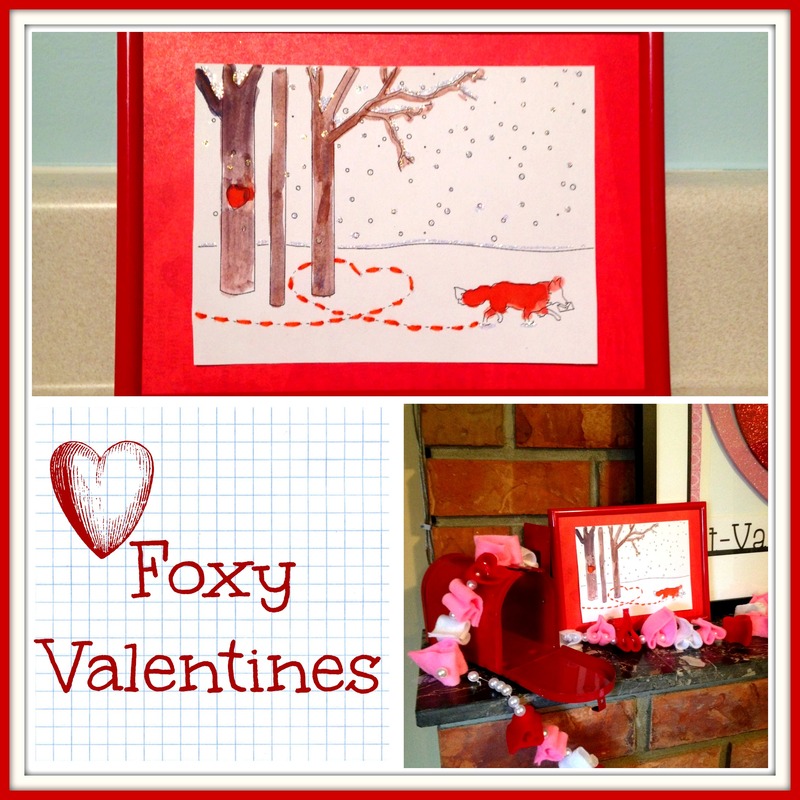 Please see here for the Fox framed card. I love the tin mail box! Last year when we were moving my Nana into Rainbow Gardens, I started to sort through some of her crafting supplies. She was a great pack rat, and I found bags upon bags of little balls of leftover yarn. 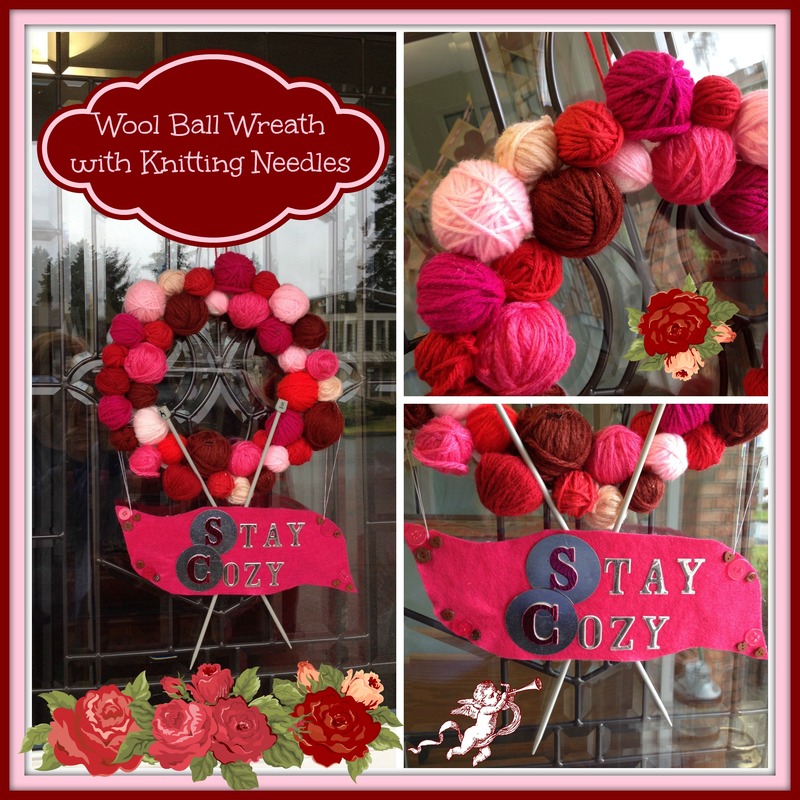 I had fun making this wreath with all of those little balls. I love the slogan I ended up with (this was based solely on the left-over chip-board letters I had at my disposal) and the needles just pull it all together. 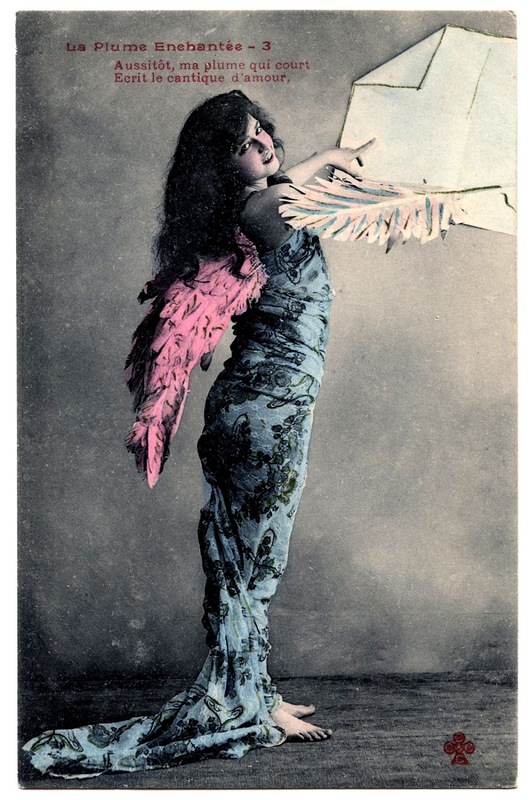 The second frilly version, is merely made of paint-chips, cut to shape, with a little lace glued on top. And then came the issue of the living room. As you may have realized, the living room has a hip colour scheme – black and white, grey and .. yellow. Now, yellow does not scream “Valentine’s Day!” I was at a bit of a loss. Stay tuned for how this got fixed.. and more! Finally, I’m back after a couple month hiatus! I DID do some Christmas crafts, but didn’t get around to posting them.. (partly as a lot of them were gifts.. couldn’t spoil the surprise!) Anyways, I’m back with the first (hopefully) of a few Valentine’s Day projects. I LOVE V-Day. love love love love love it. It’s my favourite holiday, better than Halloween, even better than Christmas. 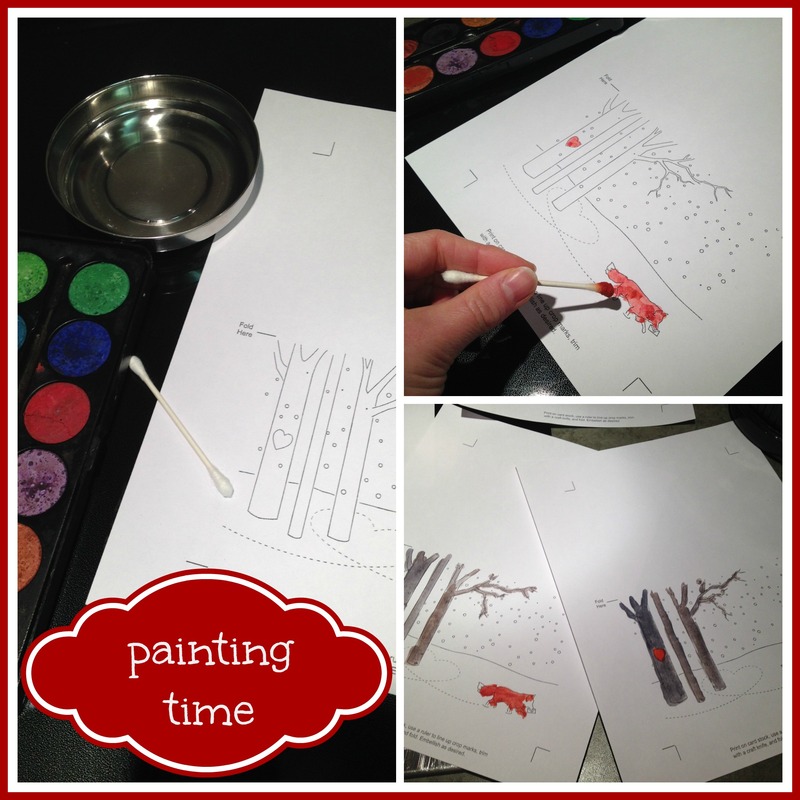 So, what better way to start out 2014 than with a quick and easy project. It took me way longer to blog it, than it did to make it! I’ve been inspired by the embroidery hoop seasonal art floating around Pinterest since Halloween.. so I’ve been collecting them as I find them at the thrift store. 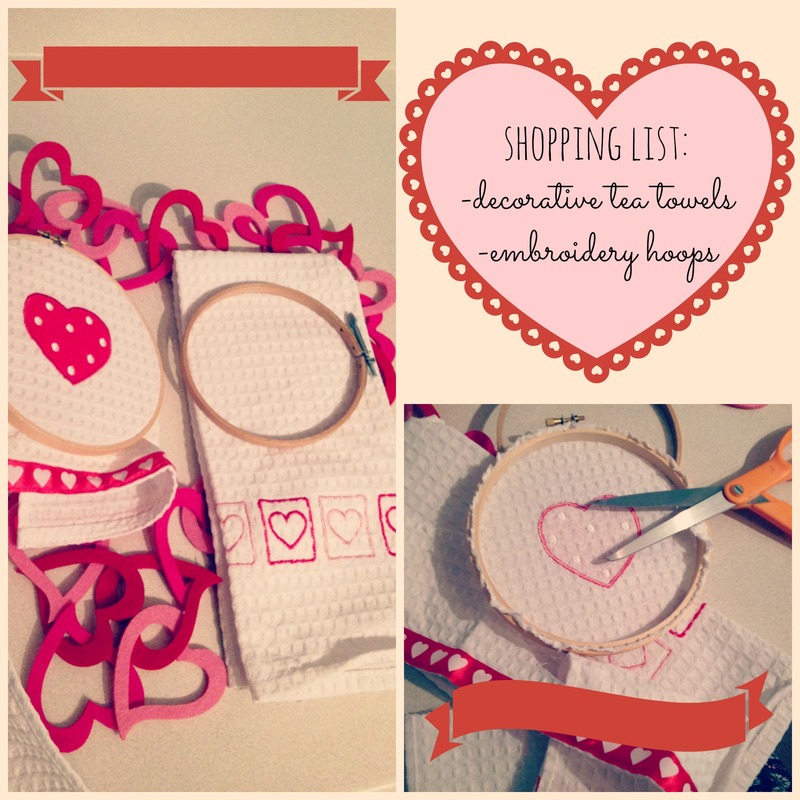 There are tons of embellishments one could add – buttons, ribbon, painting the hoop – not to mention embroidery! But I like these little gems just as is. So much so, that I’m keeping them in my craft/laundry room so I can enjoy them myself! I’d say that was $5 well spent! At the end of last cold season (so, like in April), my hot-water bottle died. It was very sad. As I started to turn up the heat, here at home, I decided to invest another $6.79 and bought myself an ugly red rubber bottle from Wal-mart. (My old one was lovely and cream, with a sheep-skin cover! a present from my honey.. probably more than $7!) I hate the feeling of that rubber on my tootsies, so I decided to make myself a cover. Initially I was thinking of sewing some tea-towels together, but I was getting bored with my other knitting project, so I decided to start a new one. I had this fabulous chartreuse thick yarn, cast on 33 stitches and started knitting away! Basically, I just eye-balled the length and width and made myself one big rectangle, using a FULL bottle as a template. Then I sewed up the bottom and one side (the other side is just folded). I had these adorable granny-squares from the summer I taught myself to crochet from youtube. I had the grand plan that I was going to make an afghan for my friend’s wedding. As you may have realized I do not do well with huge, long term projects (Lord help me next year when I have to do my big thesis for grad-school! ), so I have a total of 8 squares.. they will now serve to decorate hot-water bottle covers! I also added a little button to finish it off. Finally, I used a crochet hook and threaded some yard around the top of the cover to create a little draw-string for the neck of the bottle. I made a little tassel with the ends. Apologies for the colours of these photos.. it does not do this project justice. The chartreuse and turquoise are fabulous together! 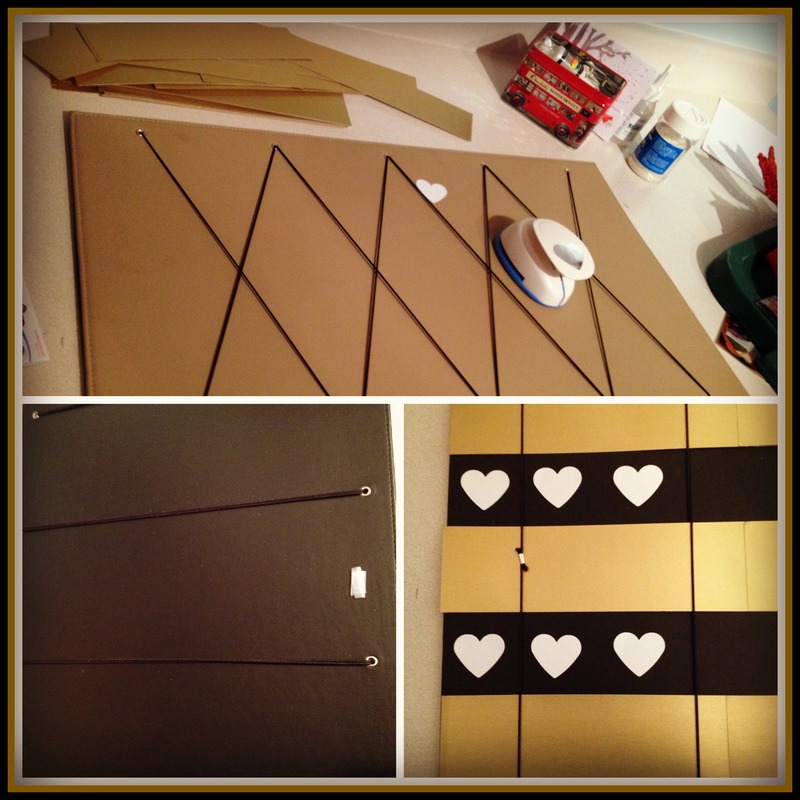 This project was so fast and easy, I’m making a second one tonight. Now the boys won’t fight over it. Wait a minute.. I’m going to have to make 2 more if I ever want one for myself! 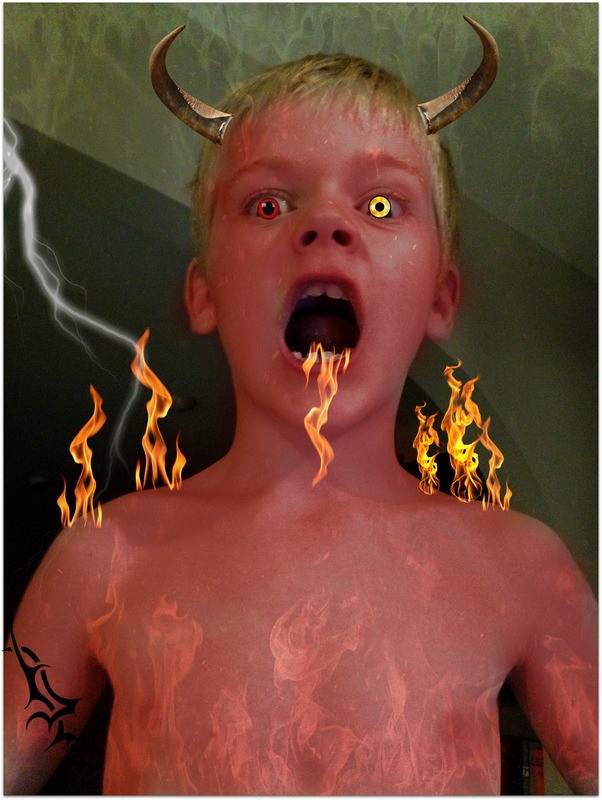 Well blog-readers, I have finally finished all of my “must-do” jobs for school (i.e. : report cards) and for grad-school (i.e. : final paper and presentation) so I’ve got a little time to post on the ol’ CF blog. 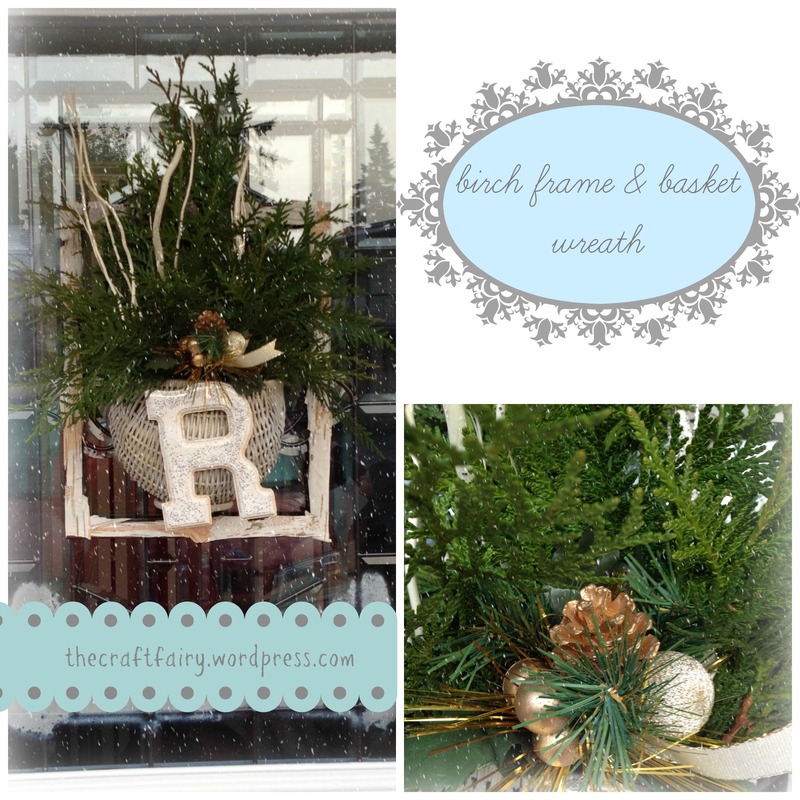 I made this fabulous frame-wreath a couple of weeks ago. I’m so happy with how it turned out! Of course, the fabulousness is totally in the details. I found the birch bark on the ground in P-ville not long ago.. I knew I wanted to use it for something special. I bought a frame for $1, sprayed adhesive, and pressed the bark on.. easy-peasy. The great thing about this, is that it’s not attached to the basket at all, so you’ll be seeing this in another form soon, I’m sure! The basket is FLAT backed. This is super important, so that it lays nicely against the door. I had had my eye on this basket for a while, not sure how to use it.. this is the perfect application. Once again, it can be easily filled with other items (I’m thinking maybe Easter eggs!) for another season. I sprayed a little white and gold, as I didn’t love the original dark brown colour. Since I wanted my greenery (cedar from behind my back-yard fence) to last all season, so inside the basket is some floral foam. (It came in the basket from the thrift store.. 75c). 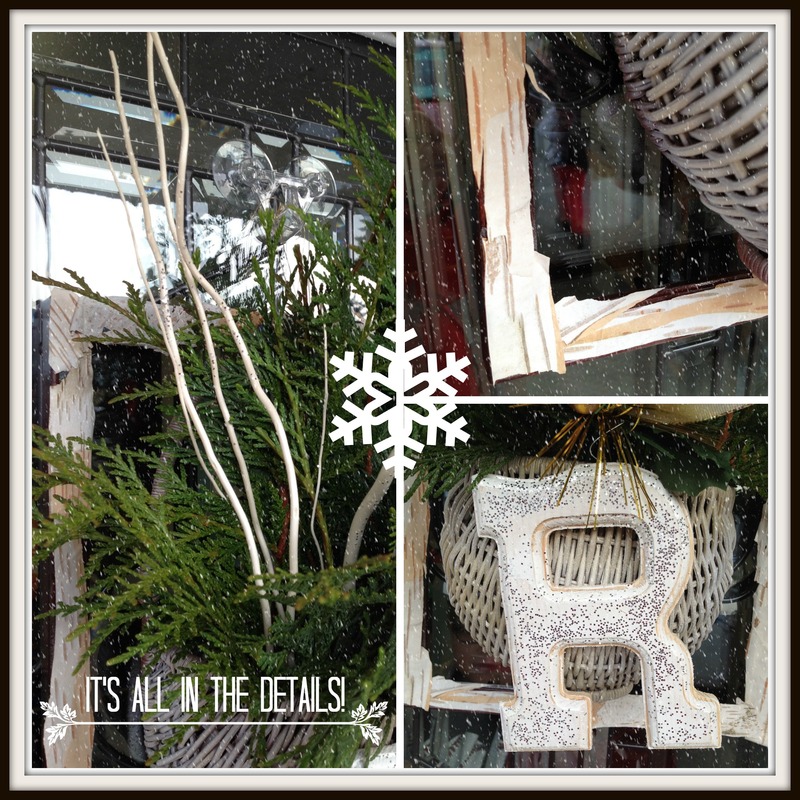 I found (SO EXCITED) the same kind of monogram as I used in the Candy Cane wreaths but an R at the thrift store, so I knew I wanted to incorporate it in this wreath. I simply painted it white and sprinkled some OLD SCHOOL Glitter (that’s important.. I hate the crappy cheap plastic-y glitter that is all too abundant at the dollar store), while the paint was still wet. I also sprayed some adhesive to some white branches I already had and sprinkled glitter on it too. Just a little fun detail that adds some sparkle up top. I always pick up little fake floral picks when I see them (the older the better.. love those mid-century plastic ones!) This one was 25c and totally worth it for the little gold balls and pinecone. I’m super pumped about this festive first-impression. Shut the front door! I was sooooo excited when I found washi-tape at the local $store in my small town. I’ve been following the zillions of projects one could do on Pinterest, and bought every colour and pattern they had (yes, all 3 packages!) When I saw the red and white stripe, it screamed CANDYCANE at me, so I acquiesced! 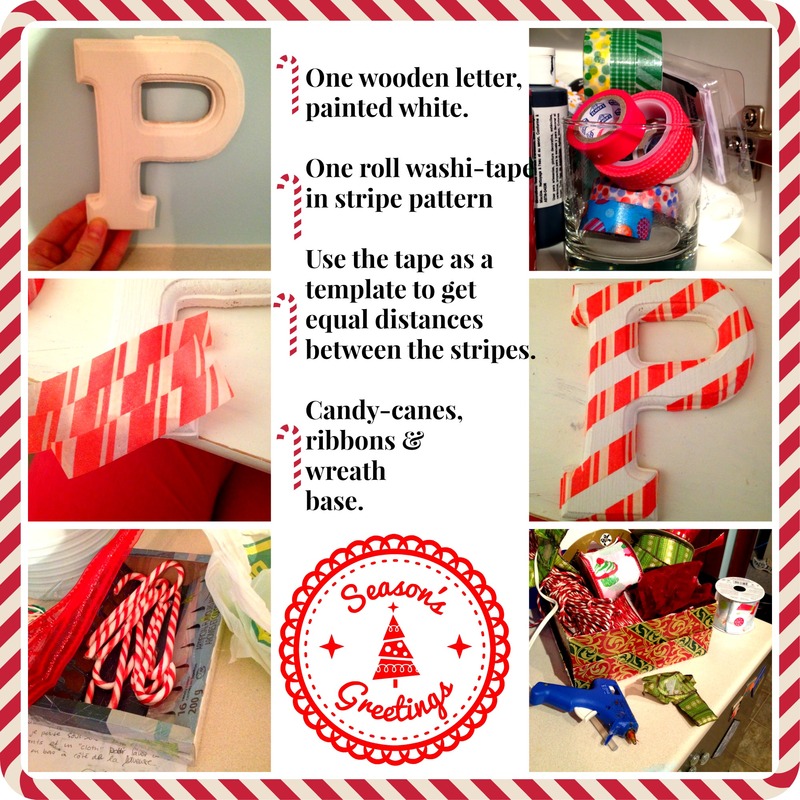 After I had both forms ready, and the monogram letters prepped, I played with the placement of the candy canes, then added some pretty ribbon. I love how two canes became 1 heart. (Isn’t that a song?) I’m really super pleased with how these turned out. I hope their recipients will be equally as thrilled! A joyful wreath. This one I actually made last year, but it needed a few little touch ups. I wrapped yarn around a pool noodle. Made a little “joy” bunting, out of felt circles, triangles and chip-board letters. I made a pretty poinsettia out of felt petals and yellow buttons. The petals I pinched and glued to make them stand out. Washi-Tape Cards. I have a bunch of bosom buddies who celebrate in December. I had a great time using my new-found washi-tape and paint-chips to create lovely cards for them. With report cards and a major grad-school project looming, I’m not sure how often I’ll be posting this month.. but you can be sure that I will continue to craft.. great way to procrastinate! One chilly morning before school (my school, as in, as well as being a teacher, I’m doing grad work) my friend and I walked down for a cup of coffee and happened across a new little boutique filled with chic little doodads. I totally fell in love with these mercury glass votives that were covered in a band of knitted yarn, and finished with a twine bow. They retailed for about $12, and sold by Imbada.. I can’t find them online to show you, sorry! 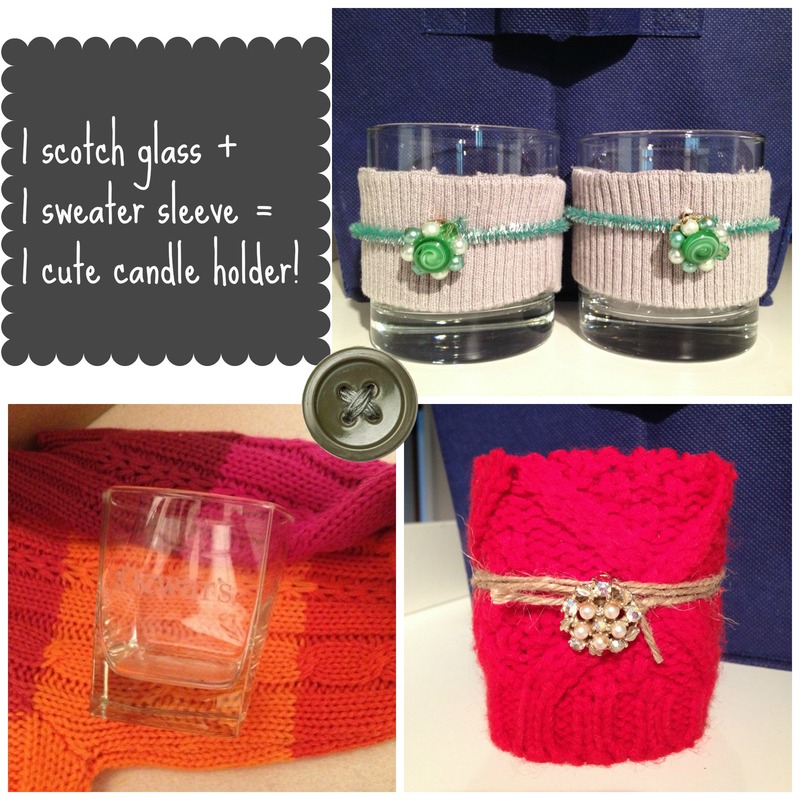 After class, I popped over to the BEST thrift store and loaded up my cart with 15 scotch glasses (49c/ea) and two sweaters ($3 and $4)… lucky for me, my husband also shrunk one of his sweaters this week, so I put it to good use too! One sweater that I bought had these large horizontal stripes in beautifully rich fall colours. 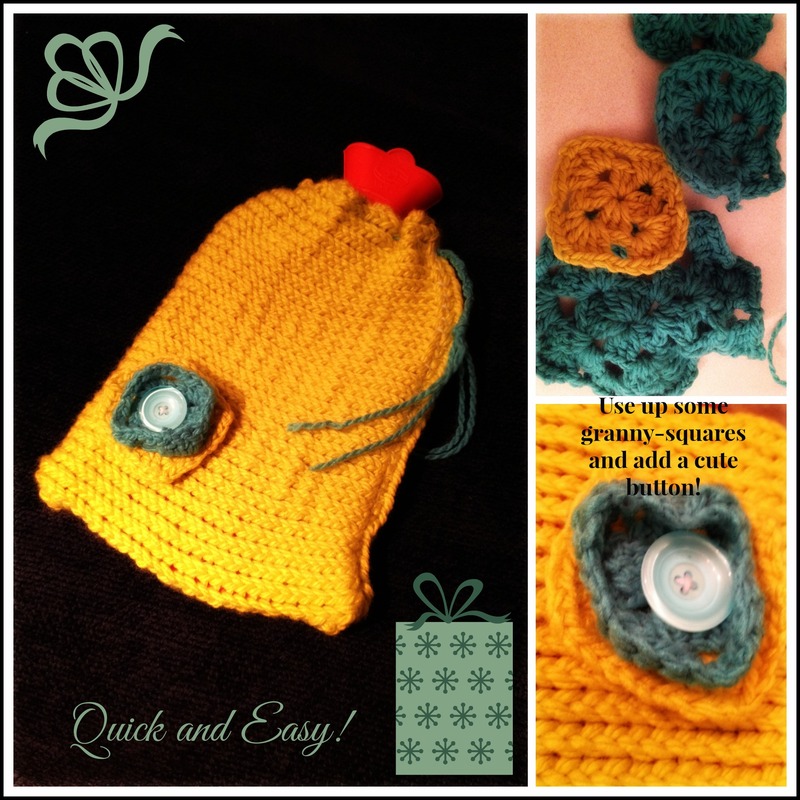 I was excited to make a grouping of these for my friend Teresa’s birthday present. I started out by cutting off the cuff (plus a little more) from the sleeve (burgundy). This proved to be the best cut, as the one edge was finished, and I could glue the other edge to the bottom of the glass! For the other colours, I continued to make cuts up the sleeve at each stripe ending. I experimented with various ways of finishing the “sweater” so that it wouldn’t unravel. I glued hems on both sides (fuschia), I glued a hem to the top of the glass, and glued the rest underneath (burnt orange). 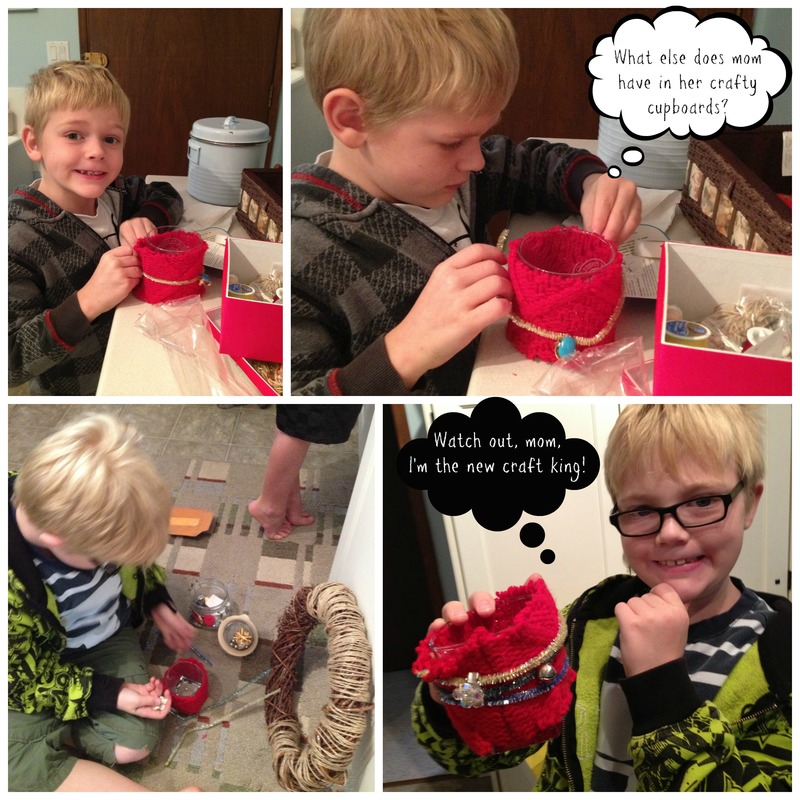 After I was happy with the sweater placement, I added a string of twine, and an interesting button. These look beeeeooootiful when they are all lit up. The light shines through the pattern of the wool and creates a warm glow. They turned out so well, that I got cracking with the other two sweaters at my disposal. Of course, the kids found me in the end, and insisted on participating! They had a great time making 2 candle holders for their Granny. They used sparkly pipe cleaners and old brooches and clip-on earrings… even jingle bells to make them special. 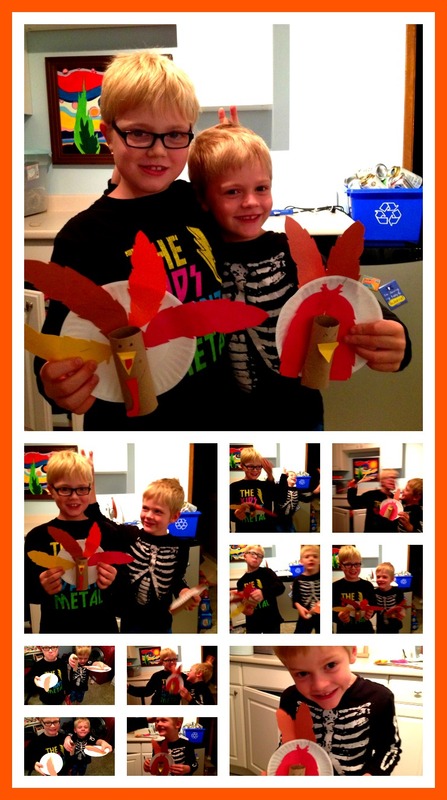 I did not let them use any glue, and it was a great independent project for them. I also got excited with the jewels and the pipe cleaners, and made a few other candle holders. I’m really pleased with the result, the time it took, and the price of the end product. 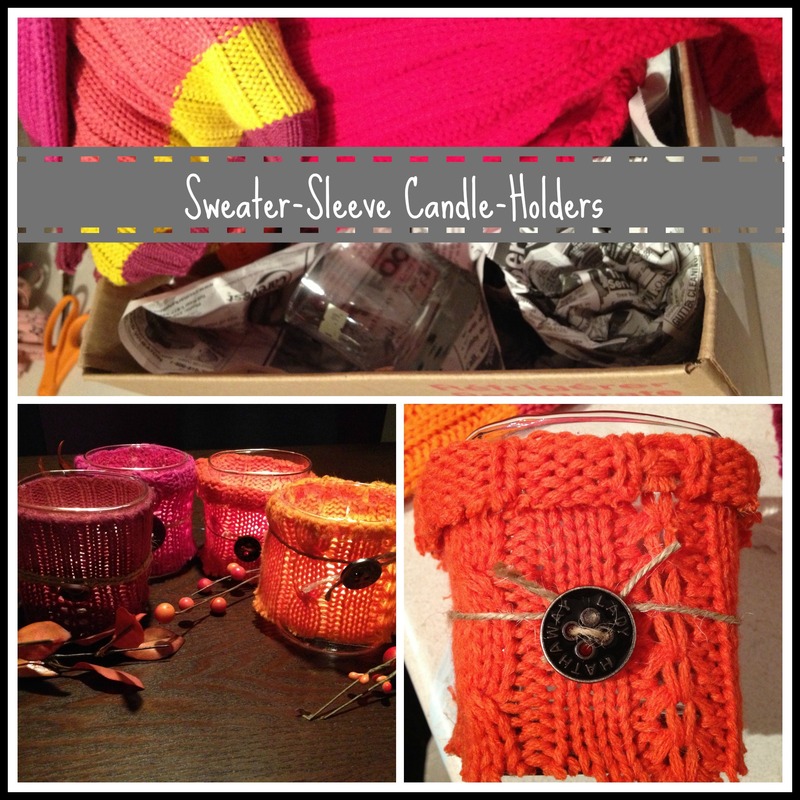 I’m excited to give these as unique and personalized hostess gifts this year… You never know, one might be for YOU! 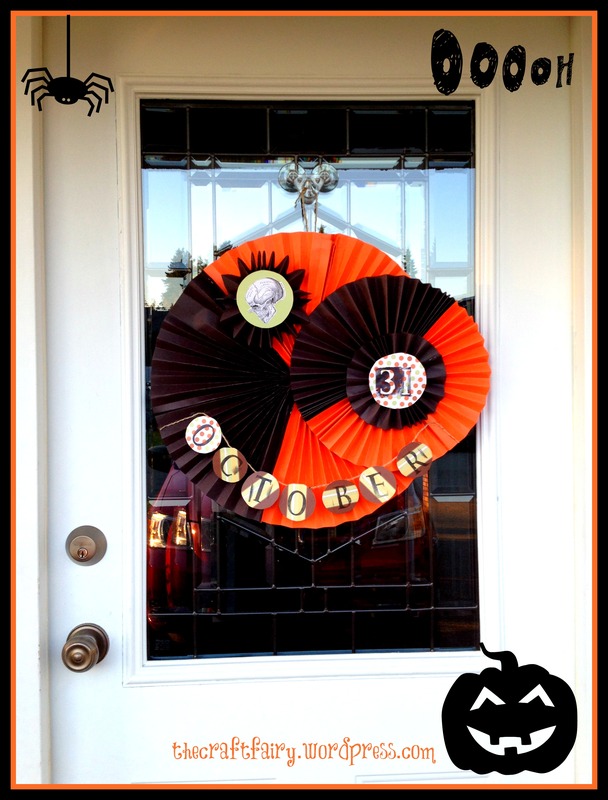 I needed something on my door for Halloween, but didn’t want a traditional wreath. After completing my darling pinwheel ornament for my Halloween tree, I decided to keep going and make a collection of bigger (medium and small) pinwheels for my door. I started with some huge sheets of construction paper (12×18) and folded away for an hour or so! The largest pinwheels were made using 3-4 sheets of paper, folding the sort end in an accordion style. I also made some smaller pinwheels as I knew I wanted to layer them. 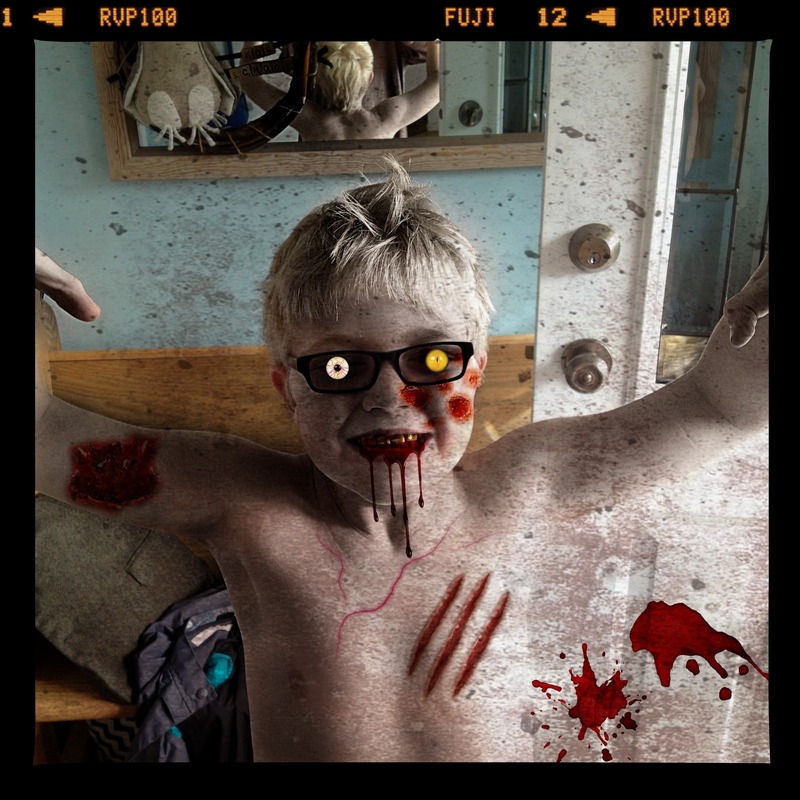 After I had decided on the right “look” I hot glue-gunned them all together. I used some scrapbooking paper and cut out 9 circles. On one circle I glued an image (from the graphics fairy) left over from my witchy board. 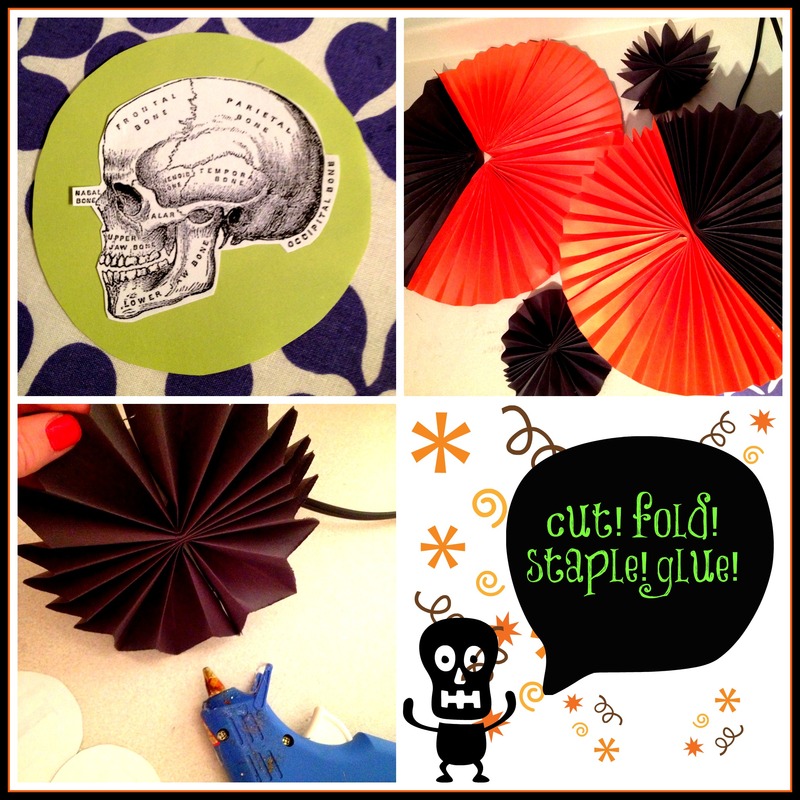 On the other, I stamped “31” and mounted these on a pinwheel. 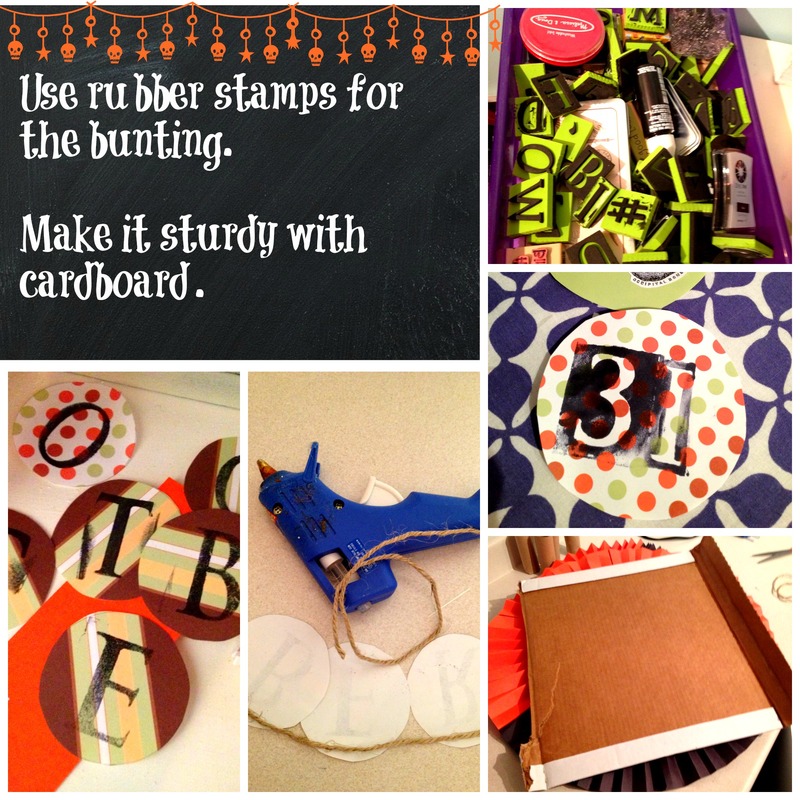 The other 7 circles I turned into a little bunting, using rubber stamps to spell out October. I used a bit of twine and more hot glue to attach the paper to it. I love the way the rubber stamps leave that shadow of ink. I could never stamp anything with out that happening, and now I’ve decided it adds character! hah! I did have to attach a box top of cardboard to the back of the pinwheel collection to keep it sturdy. No one sees that part, so I don’t mind that it’s ugly! 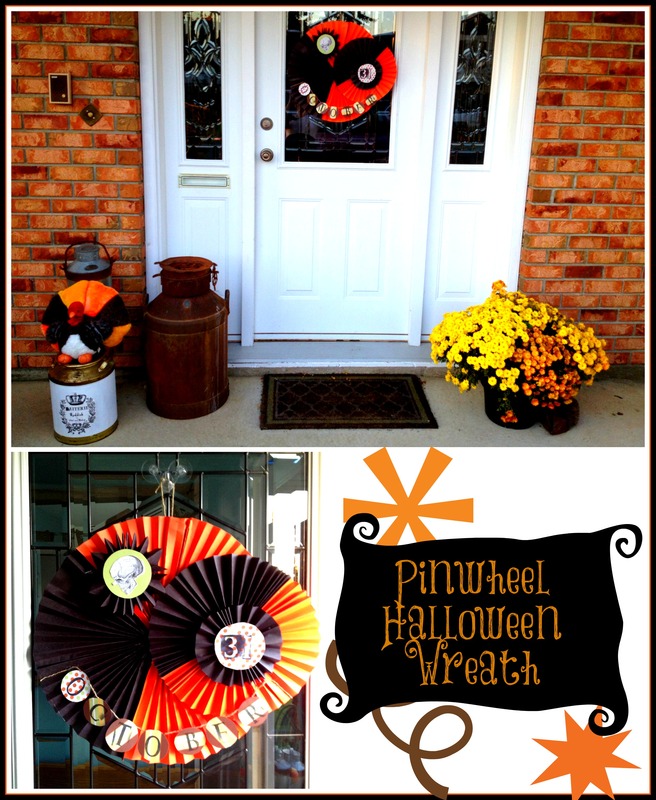 While the October sun has faded my pinwheel wreath over the past week (I’ve been way to busy to blog! ), I actually love the faded orange, and the faded black is now brown-ish. It looks all old and decrepit. I also love that this whole thing can be tossed in the recycling bin November 1st. I’m really struggling to find room to store all of my seasonal creations! 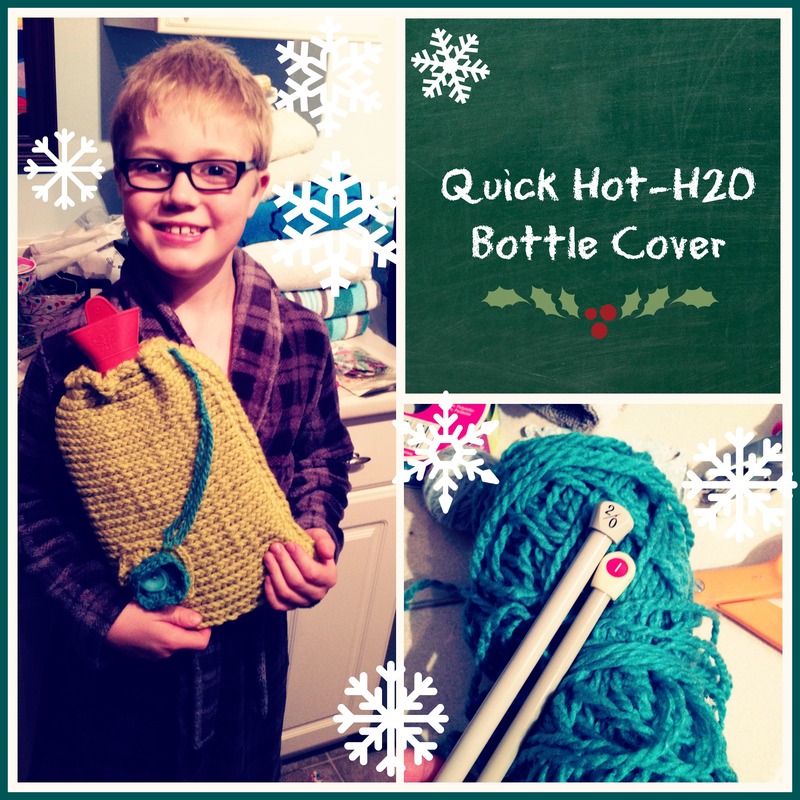 A disclaimer: This may or not be a regular thing – where I post kid’s crafts – ie: for my kids, by my kids – but they were super eager to help me make an example for my class, that I thought, what the heck- let’s blog about it! This Friday, I am having a Thanksgiving dinner in my classroom. (Yes, I am crazy… but it’s pot-luck, so I’m not THAT crazy). I like to eat family style, so the children sit at the table, and parents serve. 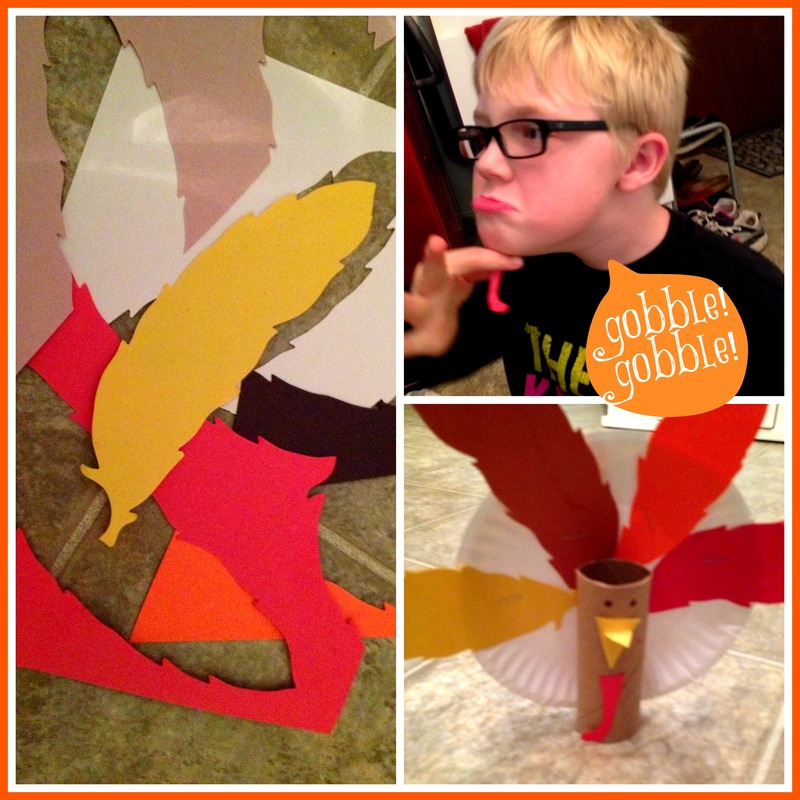 Last year I made cute turkey place cards, (but I can’t remember what I did) so I came up with this little project for this year. I am lucky at my school to have a dye cutter, so I started this process by cutting a gagillion feather shapes out of a bunch of different coloured construction paper. 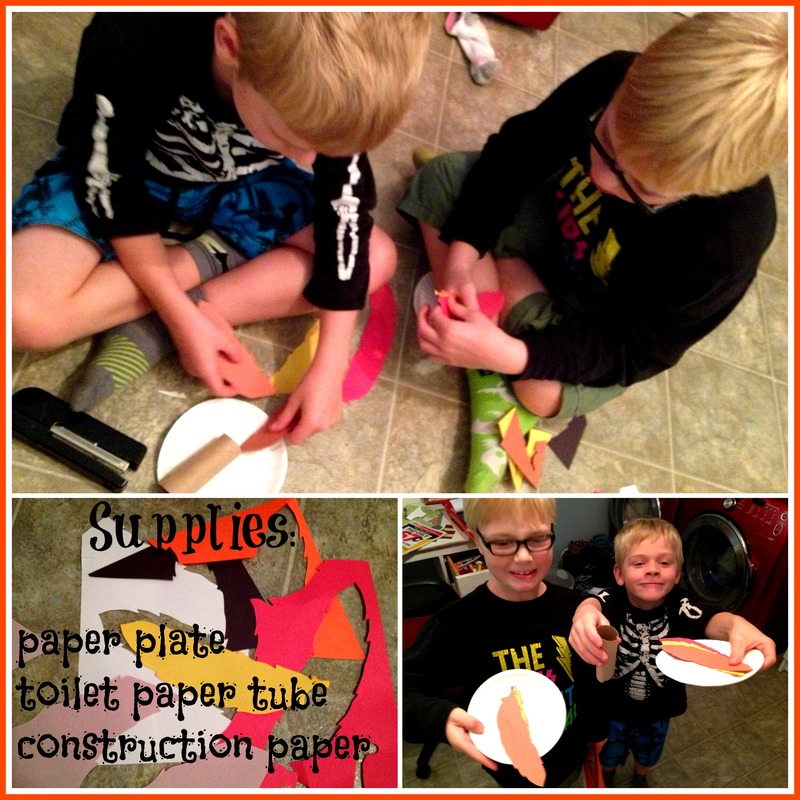 The other supplies you need are: paper plates (we have the super thin ones, at school which are GREAT for this) and toilet paper tubes (shout-out to all who responded to my Crafting SOS last night!). My kids used a stapler to attach the toilet tube and plate. Then they started using a glue-stick to glue on the feathers. I love how Dav got so creative about his feather placement! Then I encouraged them to use the extra construction paper (we NEVER waste paper!!!!) to make other features.. like Cade’s waddle. 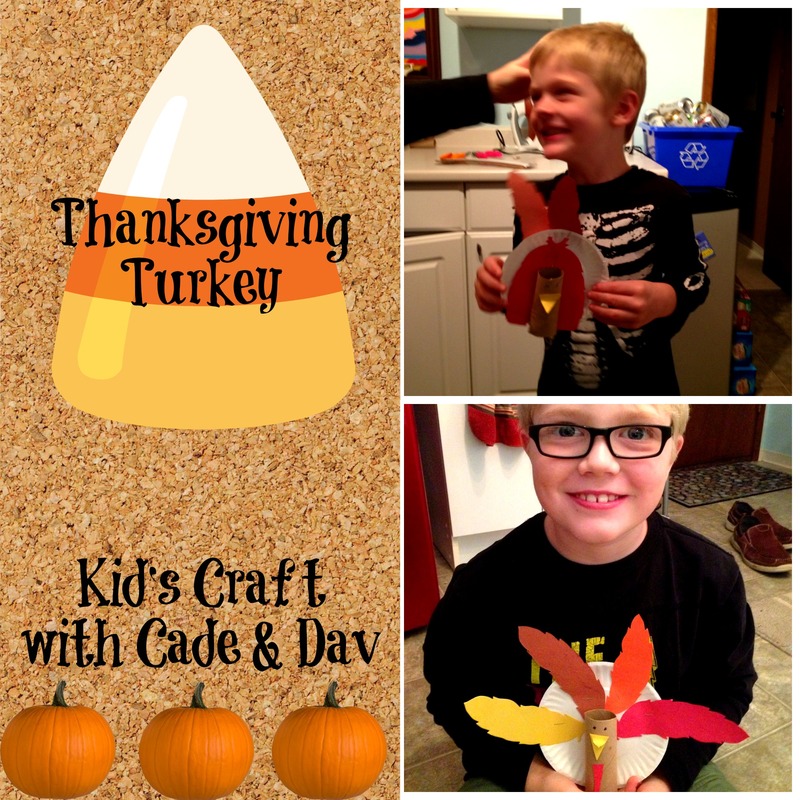 These little turkeys stand up just fine on their own. My class will add their name, and perhaps some real feathers, if I can find any in the art supply cupboard. Hope you have a wonderful looong Thanksgiving weekend! Outtakes: You wouldn’t BELIEVE the number of photos I had to take before I could get one useable one for the title image!